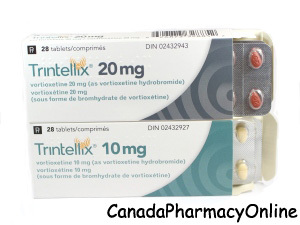 Order Trintellix through our trusted Canadian Online Pharmacy at an unbeatable price. We currently have the brand Trintellix from Canada manufactured by Lundbeck. There is no generic available for this medication. Trintellix is available in the strength of 5 mg, 10 mg and 20 mg tablets. Browse through our website CanadaPharmacyOnline.com and save your money. For more information and further details, please call Customer Service at 1866-920-3784. Trintellix (Vortioxetine) is a prescription medication that is used for the treatment of the symptoms of major depressive disorder in adults. It also helps to prevent the symptoms of depression from returning. Vortioxetine belongs to the family of medications known as antidepressants. It is a serotonin receptor modulator. Trintellix works by helping to restore the balance of certain natural substance called serotonin in the brain. This medication may improve your mood, sleep, appetite, and energy level and may help you live a normal life. You should not take Trintellix if you are allergic to Vortioxetine or if you have any other allergies. Before you start taking this medication, talk to your doctor about your medical history and about all the medications you take including OTC and herbal medications. This medication may make you dizzy and alcohol and marijuana may make the effects even worse. You should not drive, use machinery and do anything that requires you to be alert. You should avoid alcoholic beverages. This medication should not be used during pregnancy. It may harm an unborn baby. Talk to your doctor if you have planning to become pregnant or think you may be pregnant. It is unknown if this medication passes into breast milk. Talk to your doctor before breastfeeding a baby.